A PETTICOAT AND LAMBSKIN GLOVES. 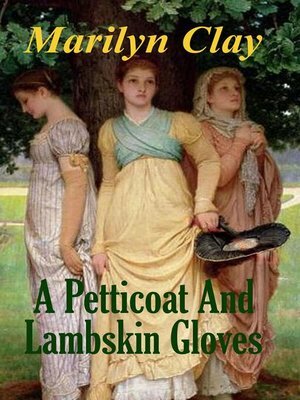 From a 5 Star review on World Cat: "Master of historical detail, Marilyn Clay writes with intelligence and lyricism. In this page-turning tale of adventure and suspense, four young ladies set out for the New World on a Bride Ship from England in 1620. All four girls are looking for love, husbands and the dream of a new life. "However, each girl carries a secret and once they reach Jamestown, the girls are instead drawn into a twisted web of lies and deceit that prevents each of them from finding the happiness they seek. It falls to one young lady to unravel the long dead secrets that lie just below the surface in the Jamestown settlement. As in Marilyn Clay’s former Jamestown novel, DECEPTIONS, the colonial village springs to life and readers quickly find themselves drawn into the character’s lives, wondering what will happen next. Also interesting is finding out what happened to Catherine and Phyrahawque, Adam and Noah, major characters in Marilyn Clay’s first Jamestown novel, DECEPTIONS. Both the premise and plot of A PETTICOAT AND LAMBSKIN GLOVES is unusual and intriguing. You won't want to put this historical suspense novel down! A great read and highly recommended." MARILYN CLAY’s most recent novels include the critically acclaimed Miss Juliette Abbott Regency-set cozy mystery series; MURDER AT MORLAND MANOR - Book 1, MURDER IN MAYFAIR - Book 2, MURDER IN MARGATE - Book 3. All are available in both print and Ebook. Watch for Book 4 in the Juliette Abbott Regency Mystery series, MURDER AT MEDLEY PARK, coming in 2018. All of the Juliette Abbott Regency Mysteries are available in both print and Ebook. All are clean and wholesome and suitable for teens. Another of MARILYN CLAY’s romantic historical suspense novels set in the New World in the early 1600s is DECEPTIONS: A Jamestown Novel, published in hardcover by Five Star Gale and now available as an Ebook. Catherine travels to the New World in search of her betrothed but finds that not all is as it seems in the Jamestown colony and wonders who amongst the settlers she can trust? BETSY ROSS: ACCIDENTAL SPY, set in 1776 Philadephia. Betsy Ross vows to uncover the killer responsible for the death of her beloved husband John Ross, but can she bring down the ruthless double spy before he kills her? Available in print and Ebook. STALKING A KILLER, a contemporary murder mystery set near Dallas. Aspiring PI Amanda Mason sets out to clear her own father of a murder charge but will she, or those she loves, die in the process? In print and Ebook. MARILYN CLAY is also the author of seven Regency Romance novels, all previously published in print. Look for her newest Regency, THE WRONG MISS FAIRFAX, recently released in both print and ebook. If you like historical fiction by Sara Donati, Esther Forbes, Laurie Anderson, Kate Quinn, Karen Odden and Jim Fergus, you’ll enjoy Marilyn Clay’s colonial American historical novels. An award-winning author and respected historian of the Regency period, MARILYN CLAY is a former University Editor for the University of Texas at Dallas. For sixteen years, she published The Regency Plume, an international newsletter containing articles of interest to writers, historians and others interested in all aspects of the English Regency.